With only a few days up my sleeve, and winter just upon us, the question of where to shoot required some thought. I have a lot of photos ideas, a combination of locations I've scouted from previous trips, discussions with locals, images that have inspired me, and my own research. These I keep in a series of folders, broken down by state and annotated as new information comes to hand about seasonal preferences, access, tide requirements, light direction, and so on. Some pages are more of a wish list, a beautiful place I'll probably never be able to afford to visit, whilst others are reasonably local. Trawling through this cornucopia of dreams I came across a little scribble I'd jotted down some years ago, "Cape Otway Lighthouse, gate closes 5pm". A quick check on-line revealed that sunset was about as close to that deadline as it was going get and those two little words dear to the hearts of landscape photographers "partly cloudy" was forecast. I threw together my kit and hit the road. Heading south I made the cape in good time, and even managed to negotiate a few minutes extension with the gate keeper. The clouds were moving fast but offered a good mix, opening enough to allow direct golden light on the subject whilst still providing a dramatic curtain behind the scene. As I set up, however, the wind immediately made itself known and a light rain commenced. Not usually a problem, in fact a rainbow almost formed, but as fate would have it my big umbrella chose that moment to expire. In a performance fit for the stage, I danced about entangled in its clutches, oscillating between pleading and frustration. There's something universal about such an event. Search your memories and I'm sure you'll find a similar one. In any case I was a source of entertainment for the remaining sightseers. Fortunately my gear can withstand worse, and with a bit of luck and some carefully timed shots I had it in the bag. The question then became "where next?". I knew Mt Hotham would be getting a nice dusting of snow, so I set off in that direction, getting as far as Bright village before sleep took me. Never one to open my wallet unnecessarily had a good kip in the car, before heading up the mountain. I'd shot Feathertop from Hotham a few times before but wanted to refine my composition to include more foreground and really focus on the folding hills. It all came to together nicely as the sun set. As an observation, I noticed Hotham seemed to attract two major groups of vehicles on this occasion. Your serious off-roaders, big trucks, all covered in mud, engines revving and then your flash luxury European cars, quietly sliding sideways over the ice on their street tires. It was like watching two worlds co-exist. Not sure where I fit in exactly, the exception to the rule, an invisible outlier, which suited me fine. With one day left I headed home via Howqua Hills near Mansfield. This area is home to several interesting huts, which I've explored often over the years. I knew Frys Hut well and got myself there well head of dawn, surprised to find what would have to be over a hundred people camped in the valley. I was too tired to relocate, so after a quick scout with a torch, I curled up on the driver seat for the night, and slept like a log. Pretty soon the alarm had me up and shooting. A light fog and some hints of yellow in the sky made for a nice capture, but it was as I was driving out that the real magic happened. The fog thickened and the morning sun came streaming down through it creating a scene like something out of a story book. With every turn in the road it just got better and better until finally I stumbled into picture perfection, a gift from nature herself. I worked quickly to capture the best of the light. The fog changed shape continuously, causing shadows and highlights to shift. After many frames I knew I had the best of it. What a serendipitous find! Now for something more on the business side of things. During this period some homeowners approached me with a novel idea of using one of my images as their kitchen splashback. They went ahead with my Dawn Lights the Dandenongs image and reported back with excited comments and some pics which I've included below. As a note to any other buyers, if you'd like anything not offered on this website, just shoot me an email and we can find a local printer. 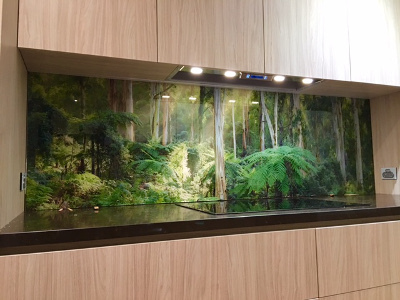 Left: Photo printed on glass for a kitchen splashback. "It's come up beautiful. The lights above the benchtop pick up the sunlight in the image and it almost looks real. Thanks again for allowing us to use the image, we're very happy with it." My next adventure, deeper into winter will likely involve snow, and lots of hiking. So until then, I'll say goodnight.